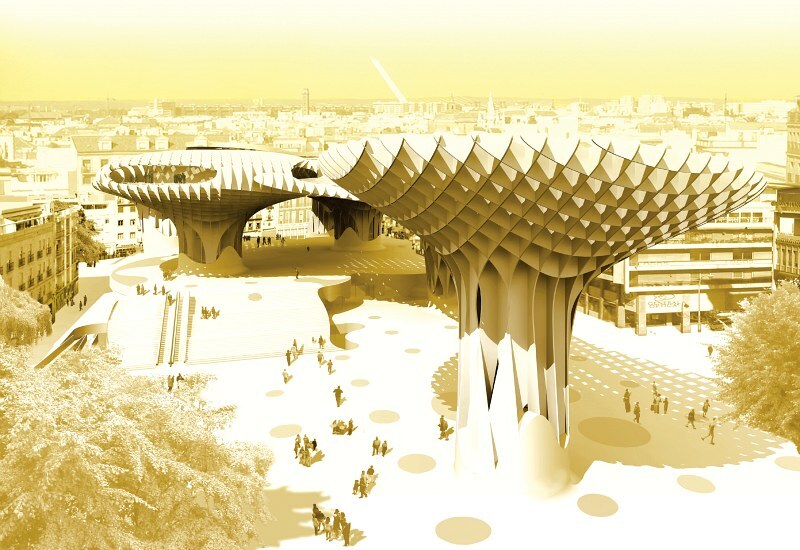 An incredible set of massive wooden parasols is currently springing up in Seville, and when they're completed next Spring they're expected to form the largest wooden structure in the world. The urban project, called Metropol Parasols, will create a sheltered plaza that hosts a museum, a farmers market, and a cultural center. Residents and visitors will flock under the giant umbrellas to take refuge in the microclimate while socializing and taking in the city. Amazingly, the covered courtyard project isn’t just an attempt to give the people of Seville a shady place to hang out. The site was originally meant to be a parking garage, but during excavation in the early 2000s, workers discovered a hidden archaeological site. Thankfully, instead of going on with the original plans, they decided to make the space into a culture and community center, which will be called the Plaza de la Encarnacion. Underground facilities have been constructed to assist with the archaeological dig, while the street level hosts a covered farmer’s market, a public plaza, and multiple restaurants and bars. Visitors can also take a promenade up top on the parasols, which will offer incredible views of the city. Access to the museum and archaeological site as well as the rooftop promenade is provided via the columns. 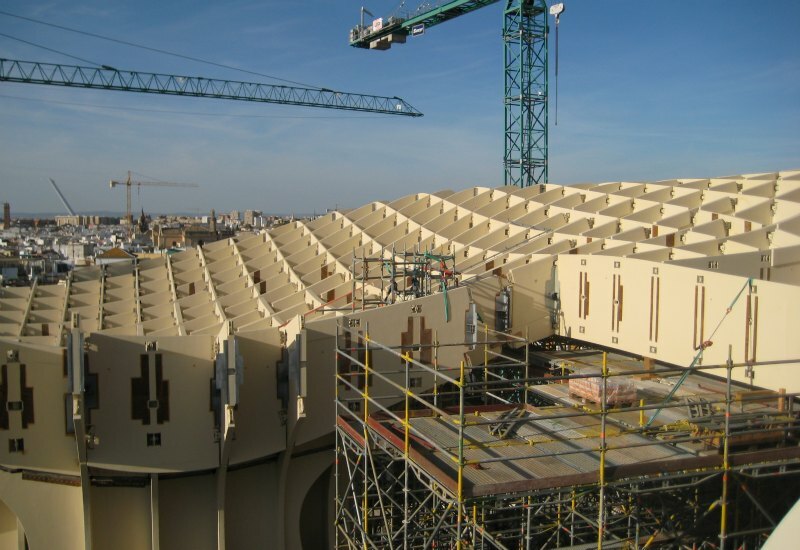 The parasols are constructed of timber plates finished with a polyurethane coating — the project is partially funded by the largest European contractor of advanced wooden structures and timber & glass cladding, finnforest-merk (FFM). This mesh-like wooden structure will provide shade below, creating a microclimate that encourages urban activity and community engagement. J. Mayer H. won a competition back in 2004 to design the project, and he was assisted by Arup on the engineering side. Images and renderings courtesy of Jurgen Mayer H.
Living in Seville and knowing the project from the beginning, I can only say it has been a complete waste of time and money. It has been delayed several times and has almost doubled the initial budget, up to (hold on tight) €89,6 million. Did anyone notice how big there are - it would take a century for a tree to grow that large. Clearly they wanted to effect now and didn't want to wait three generations for trees to grow. What is so green about PolyUtrethane coating ??? actually, i had to comment again (sorry). i think the walkways in the upper part of the structure are cool too. that should have been the first point they mentioned. "Residents and visitors will flock under the giant umbrellas to take refuge in the microclimate while socializing and taking in the city." I love how this is just an overly fancy way of saying that people will enjoy the shade. And I love even more that the whole project is being designed to perform the exact same task as the modern tree. Except instead of sequestering carbon and lessening the heat island effect through evapotranspiration, it will only provide shade and nothing else. So essentially its like a tree, but harder to build, a lot more expensive overall, and isn't even as good. Well done. how many trees do they need to chop per structure? 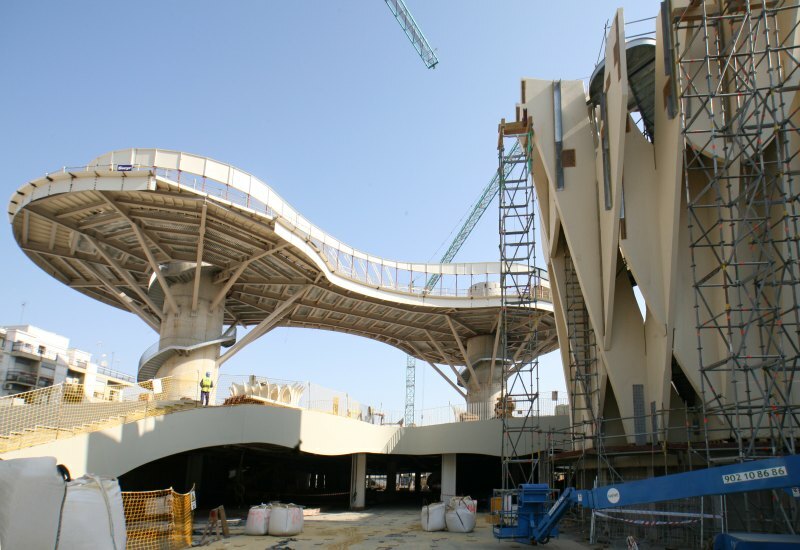 Construction is underway on the massive urban project in the center of Seville, Spain. It is expected to be complete in Spring of 2011. Designed by German firm, J. Mayer H., along with consulting from Arup, the massive shade structure is built out of wood and is expected to be the largest wooden structure in the world. Back in the early 2000s, work was underway to build a new parking garage on the same spot, but workers uncovered an archaeological site. A decision was made to scrap the garage and instead build a community center over the archaeological site. J. Mayer H. was chosen in 2004 to design the urban plaza, which will eventually include a museum for the archaeological site, a farmer's market, restaurants, bars, and a promenade on top. "Metropol Parasol explores the potential of the Plaza de la Encarnacion to become the new contemporary urban centre. Its role as a unique urban space within the dense fabric of the medieval inner city of Seville allows for a great variety of activities such as memory, leisure and commerce." The giant umbrellas will provide shade to the courtyard below and create a microclimate that will encourage activitiy. The archaeological site is located underground and facilities have been built to assist with the excavation work. The street level will contain an area for a farmer's market as well as spots for multiple restaurants and bars. The plaza can also serve as a place for public functions like rallies or concerts. Visitors will be able to access the top of the structure through the columns and walk on the promenade for views of the city. The side cuts show the various levels of the plaza - archaeological on the bottom; restaurants, bars and farmer's market on the street level; and then the wooden canopy with promenade. From above, the structure will provide a large shaded area to protect visitors from the hot sun and even reduce solar heat gain and the urban heat island effect.